After a lot of fun during the Durga Puja and a complete silence for the last 2 months, Hoichoi is back again with some “hoichoi”. This time with our maiden effort of Saraswati Puja. What can be a better start of 2018, than with your very own Saraswati Puja? So gear up to celebrate the coming Saraswati Puja with us and in a true Hoichoi style. Lets again have an afternoon filled with – mainly the Saraswati Puja, Anjali, Haat e khori. 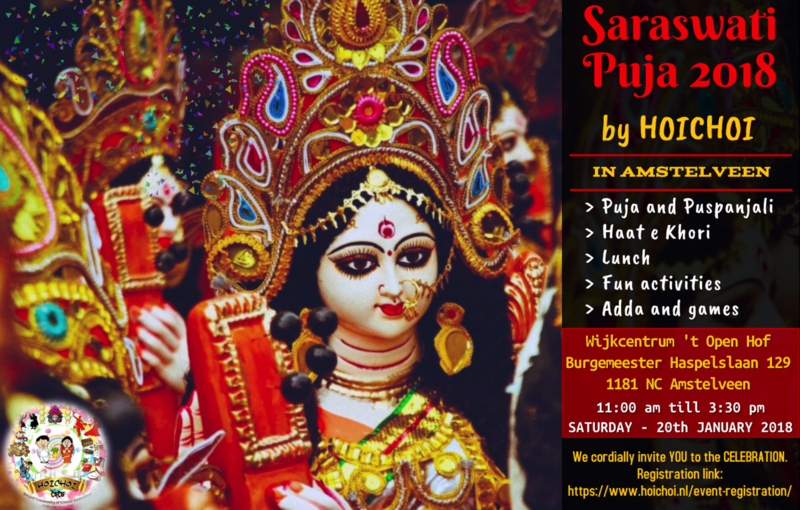 But also with a bit of adda, a bit of showing-off your yellow saree, a bit of informal cultural exchange and interactive fun activites and games and most importantly a mouth watering traditional lunch as apt for any Saraswati Puja back home. So what you are waiting for – hurry and seek your place today to be part of this. But this time, because of space constraint in the venue, we have limited seats. And we know for sure, we wont be able to accommodate all our friends and we already apologize for that. So please register asap and be a part of this celebration.